"I'm a bodyguard. Not a Spy," Mara said. The noble girl raised her eyebrows. Cast out of her family three years ago, Mara turned to the only place that would take her—a school where students train to protect others. But Mara is stunned when guarding a noble girl in the Empire's capital turns out to be more dangerous than she could've imagined. More shocking still, she finds the boy she thought she had lost forever outside the gates of her new home. Mara knew the dizzying Imperial city would hold dangers. How could she have known that her heart, as well as her life, would be at stake? 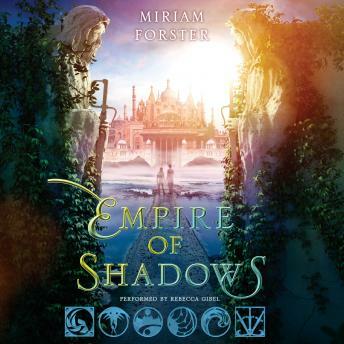 Empire of Shadows will take readers on a spellbinding journey into the world Miriam Forster first introduced in City of a Thousand Dolls—a world with a divided society, deadly courtiers, heroic traitors, and deeply laid conspiracies.